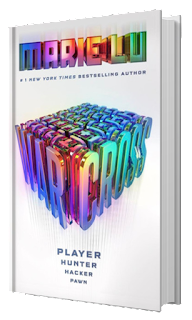 Warcross has been on my to-read list for a while now. I'm just finishing other books for me to finally read this and then I saw the blog tour post, I immediately signed up for it! Knowing this will be my chance to read the book without excuses. I am glad that I am one of the chosen bloggers and I am honored to be part of this tour. So, thank you for this opportunity! Emika Chen is a simple city girl who hardly earn money for her apartment rent and other payable. She's a bounty hunter at Warcross but that doesn't help much. In the opening ceremony of Warcross where everybody are watching, Emika suddenly did a trick that shocked every one in the game. That alone is enough for Mr. Hideo Tanaka, Founder of Warcross, to notice her existence. In that moment of her life, everything changed. It's been a long time since I enjoyed reading a book this much and while writing this review, the emotions are just flowing and the thoughts keeps coming. Beautiful, intense and exciting are the three words that could describe the book. I would recommend this book to my friends, it is a MUST READ. Also, I couldn't wait for the second book and I badly want to know if this will be a duology or a trilogy? I think that's what readers need to find out soon. "You don't have to break down every detail. You just need to see the overall pattern to catch the weakness in it." I write young adult novels, and have a special love for dystopian books. Ironically, I was born in 1984. Before becoming a full-time writer, I was an Art Director at a video game company. Now I shuffle around at home and talk to myself a lot.